As we look at the numerous graben and valleys that wind through the Martian highlands, it is not always clear which geological processes created them. Some valleys have very similar characteristics to those on Earth carved out by the flow of surface water; others possess a morphology where this is not so obvious. These images, acquired by the High Resolution Stereo Camera (HRSC) operated by the German Aerospace Center (Deutsches Zentrum für Luft- und Raumfahrt; DLR) on board ESA's Mars Express spacecraft, show the upper reaches of the Reull Vallis region, a valley that was, at times, shaped by the flow of glacial ice. Reull Vallis is an outflow channel stretching over 1500 kilometres across the massifs of Promethei Terra, in the highlands of Mars' southern hemisphere, towards Hellas Planitia, an impact basin that, with a diameter of almost 2300 kilometres, is the largest impact structure on our planetary neighbour. 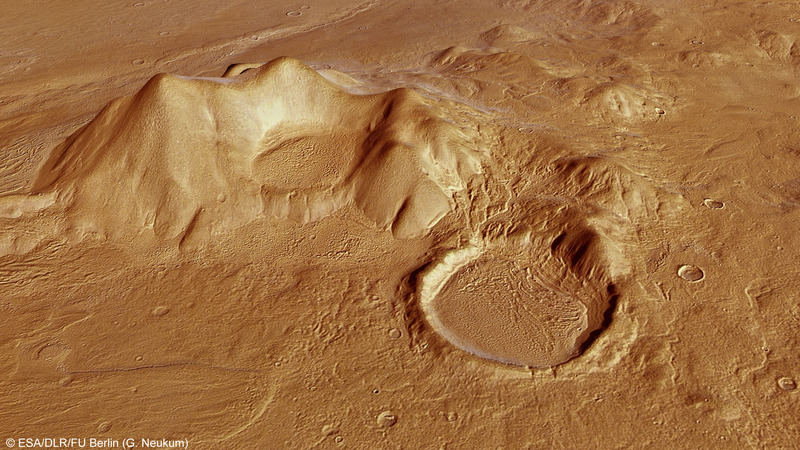 The High Resolution Stereo Camera (HRSC) on Mars Express has been used numerous times to acquire images of Reull Vallis and the surrounding mountains (see images published on 8 December 2004). The images of the upper reaches of Reull Vallis shown here were acquired on 14 May 2012, during orbit 10657, from an altitude of around 320 kilometres. They show details down to a size of 16 metres. The centre of the image is at 41 degrees south and 107 degrees east. The region shown here is around 15000 square kilometres in size, and covers an area of 180 by 80 kilometres. 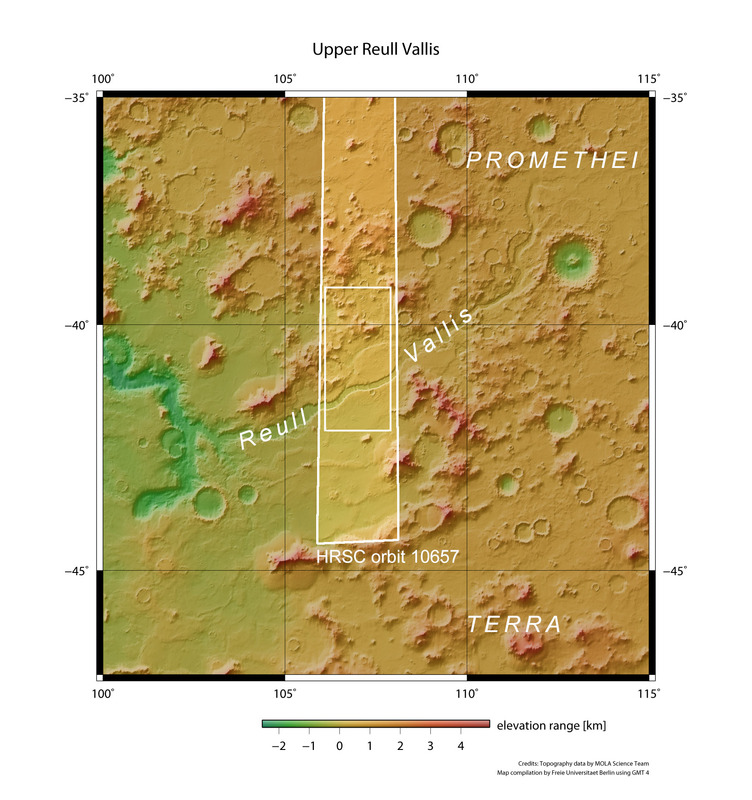 Using stereoscopic HRSC image data, from which digital terrain models can be derived, the topography of the surroundings of Reull Vallis and the profile of the graben-shaped valley can be deduced. Over one 80-kilometre stretch, the valley has a continuous width of around seven kilometres and is bound by steep, sharply contoured walls around 300 metres high. The box-shaped profile of Reull Vallis is conspicuous, very different from the familiar V- or U-shaped valleys here on Earth. The bottom of Reull Vallis is covered with deposits, on the surface of which is an eye-catching pattern indicating the flow of the material and mostly running parallel to the edges of the valley, although in some places structures intertwined like braided hair are visible. This pattern was probably created by the flow of ice - a glacier on the surface of which a large volume of rubble and boulders has been transported down into the valley. On Earth, we see comparable phenomena known as rock glaciers in the Alpine and Polar regions. In these, the glacial ice is completely covered by boulders that have slid onto the ice from the valley walls. Similar structures to those in the Reull valley are also found in the material filling nearby impact craters. 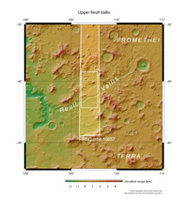 This can be seen particularly well in two small craters northwest of the valley (upper right in the vertical overhead views and in one of the perspective views). The rocks certainly prevented the underlying ice from melting and - in the chilly temperatures prevalent on Mars - from sublimating (transitioning directly from a solid to a gaseous state) for much longer. However, at these "temperate" Martian latitudes, there is a strong possibility that there is no longer any ice left under the sediments deposited by the glacier. 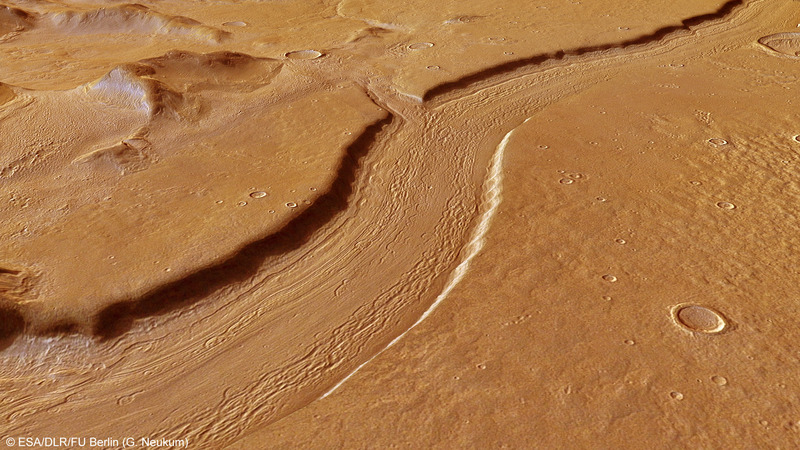 Coming in from the north (right in the overhead view), a tributary valley flows into the main channel of Reull Vallis. Looking at the local environment in the topographical map, it can be seen that a side arm branches off further up the valley. Here, about 100 kilometres further southeast, it rejoins the main valley. To the north of Reull Vallis (in the right half of the overhead views), several of Promethei Terra's two to three thousand metre high massifs can be seen as well. Their somewhat smooth morphology indicates that erosion processes have been at work here for some time. Contours of extensive layers with tongue-shaped edges and occasionally smooth surfaces can be seen between the mountains; in some places they also have a pattern that follows the topography of their surroundings, as in the craters. These might also be sediments left behind by glacial ice. However, the smooth-surfaced layers could also be volcanic deposits. Fairly evidently, a large volume of material have been carried away from the flanks of the mountains and transported into lower-lying regions, where it has tended to accumulate in impact craters. Also, the streaked pattern of the deposits in this crater that follows the circular crater rim is highly reminiscent of structures formed by glaciers on Earth. Stepped terraces on the inner walls of the craters could indicate the presence of a higher level of glacial ice covered by rubble and boulders, and that only when the ice and melt water disappeared did the sedimentary layer sink to where it is today.